Before and throughout my journey of sobriety, I have struggled with a voracious desire to be someone else. Someone savvier, someone less afraid. When I arrived in substance abuse treatment as a teenage girl, my theater background intact, I passed over the subtle value of self-awareness and went straight for the stage. I received awards and privileges. I gave eloquent answers in therapy. With a few quick gear shifts, the performance required to stay high became the performance to appear sane. A few weeks after arriving in treatment, the chaos that brought me there began to feel like a distant dream. I didn’t feel anything like the girl who had busted her head open on the street while being searched by a cop, spending the night in the emergency room, telling anyone who would listen that she was completely fine. I didn’t recognize this girl, and the more time that passed, the less I believed in her existence. But just outside of my nuanced, inpatient confusions, an unchanged truth awaited me: I would risk everything to get high. This was revealed to me with relentless repetition. The most painful example being my first break from treatment where within 24 hours, I was unconscious on my mother’s doorstep. I returned to treatment devastated and hollow. I had no idea what happened. When I think about these weeks, what I remember is being the kind of empty where nothing echoes on the inside, no matter how much noise I made. It was during this first stretch of silence that I started to write whatever came to mind. Sometimes I wrote until my hand hurt. No single part of me had to be the best part, or the right part or have the final say. Gradually, different voices started rattling the page. Writing has always held an electricity for me. But what I found, at this point in my life, was that rather than surrendering unconsciously to alcohol and drugs, writing allowed me to surrender in a way that made me feel clearer and brighter. No counselor, teacher or parent read what I wrote and more often than not, neither did I. I was looking for a place out of the reach of analysis. A place for my confusion to go where it could breathe and be left alone. Just a place where I could simply stay. I would love to tell you that after leaving residential treatment I stayed sober, but that is not my story. I continued to live in a cycle of addiction and its increasingly sad and frightening consequences until I returned to the Twelve Step program, when I was 18. And since that day, with varying degrees of enthusiasm, willingness and love, I have simply stayed. In my first year of sobriety, I started going to yoga classes with the same raw need that I brought to Twelve Step meetings. I would often lay in Shavasana and feel tears slide down my face. My yoga instructor never approached me directly about these tears. Sometimes, she would place her palms underneath my upper back and invite my chest to relax into her hands. Then she would simply stay. Today, when faced with great pain or bewilderment, the most useful thing for me to remember about my mind is that it is also a body and a heart and a set of lungs. When I pick up the pen or go to the mat, I release truths that cannot be held solely by my brain. The practice of Yoga, the process of free writing, and the program of the Twelve Steps have become three vital ropes in my life-line. Though each one compliments and allows for the other, when braided together, it is these practices of surrender that hold me in my present life. Lilly Bechtel is a certified Kripalu and Trauma-Sensitive Yoga instructor, freelance journalist and poet. Her writing has appeared in “USA Today,” “The Brooklyn Rail” and “The Huffington Post,” among others. 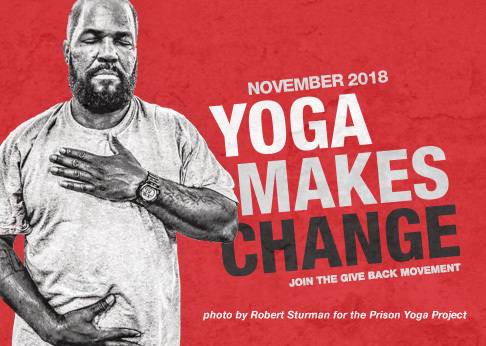 Ms. Bechtel is currently working on a book about the role of mindfulness in addressing Post Traumatic Stress in the military, to be published through the Give Back Yoga Foundation. Follow Lilly’s work and writing through Body Song Yoga on Facebook and Tumblr. Do you have a story to share for our “Personal Perspectives on Healing Through Yoga” series? View our submission guidelines. Thank you for inquiring about sharing your story with the Give Back Yoga community. We know the power of personal experience will inspire folks to explore yoga as a potent universal practice to develop self-awareness, self-control, and assist in reconnecting to our bodies, minds and spirits. Any form of original artistic expression will be considered: essay, poetry, story, video, photography, digital art, and other creative pieces. GBY reserves the right to edit for clarity, grammar, voice, and relevance. Our current schedule is a quarterly feature with this series. Publication dates will be based on GBY’s editorial calendar. We will promote Personal Perspectives through all GBY’s social media accounts and we encourage you to do the same upon publication. We will notify you of the publication date. 1. A short bio of approximately 50 words or less. This can include a link to a personal or business web page. 2. A small head shot of yourself, if you feel this is appropriate. 3. Your contact info including telephone number and email address. 4. For written pieces, please include an eye-catching image of your own or a rights-free image/photo. If you cannot find one, we can help. 5. Please send full scale images and artwork to us via Dropbox or another cloud based service. 6. Send your submission to angela@givebackyoga.org as an attached word document or in the body of the email. Thank you for being an active member of Give Back Yoga!